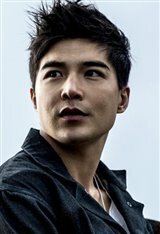 Although he has already starred in one of China’s biggest box office films to date — 2015's Monster Hunt — Ludi Lin is getting ready to bring serious star power to North American audiences. Ludi was born in Fuzhou, China, a large city on the county’s southern coast. At the age of four, he and his family moved to Hong Kong, which allowed him to became fluent in both Mandarin and Cantonese. At the age of nine, Ludi would move again, this time to Sydney, Australia, where he would spend most of his childhood. The actor spoke in an interview about his experience moving around the globe at such a young age. "Moving around sucked as a kid. On hindsight, it was a gift – being almost homeless. I think that if you want to be a good athlete, you should play a lot of sports. And if you want to be a good actor, you should experience a lot of life." Ludi’s mother was an actress in traditional Chinese theater, and watching her performances when Ludi was a child fuelled his interest in becoming an actor himself, even though his mother didn't approve. A rebellious teenager, Ludi did so anyway. After high school, Ludi made yet another move, this time to Canada, to began his university education at University of British Columbia in Vancouver. At UBC, Ludi majored in both Theatre Performance and Dietetics. Once he obtained his degree, Ludi traveled around Asia for two years. During this time, he honed his martial arts skills, studying Muay Thai and Jiu-Jitsu in Thailand and Japan. He returned to Vancouver to focus on his acting career, and landed roles in smaller television movies. His first acting role was in the short film The Intruders in 2011, playing the character Grant. In 2015, Ludi played Clayton in the TV movie Holiday Spin. That year, Ludi also starred in Monster Hunt , a Chinese fantasy adventure film about monster hunters in medieval China. The movie has made over $300 million, making it one of China’s highest-grossing box office films to date. In 2016, he also played the character of Batbayer in an episode of the acclaimed Netflix series Marco Polo. Ludi is set to make his North American blockbuster debut later this year, when he plays Zack Taylor (a.k.a the Black Ranger) in the Power Rangers (2017) reboot. A self-proclaimed adrenaline junkie, this role was perfect for Ludi, as it allowed him to showcase his already impeccable parkour and martial arts skills. He went on to play Captain Murk in the box office hit, Aquaman (2018).